We are facing a garbage crisis. From nuclear waste with a ten-thousand year half-life, to the persistent organic pollutants found in the breast milk of women living in the Arctic, to the billions upon billions of tiny plastic bits in the Pacific gyre, “garbage”—the unwanted detritus of industrial production and consumption— has taken on an unwieldy form. only seemed unimaginably foreign and dangerous to everyday sensibilities, but communicating these hazards and eliciting organized participation to prevent their spread also appeared impracticable. The first was in the late nineteenth century during the sanitation reform movement, and the other launched the popular environmental movement in the 1960s. In each case, the meanings and understandings (ontologies) of garbage were revolutionized, leading to practices and knowledge (epistemologies) unimaginable a decade earlier. New York City street before and after George Waring, Commissioner for Street Cleaning (1895), revolutionized sanitation practices and accomplished what was thought to be an impossible task. I argue that whatever instigates such transformations leaves its trace on subsequent reasoning concerning what “garbage” is, how it affects people and the environment, and what can and should be done about it. The historical meanings of “garbage” constrain, compel, and otherwise influence trash activism today. The first section of my dissertation will construct a Foucaultian “history of the present” to examine how a concrete object called “garbage” has congealed in particular ways at particular times. While some scholarship describes how certain objects have moved into or out of the category of trash, such as recyclables or antiques, and others have researched the municipal sanitation reform movement, I argue that the category of trash itself has not been stable or continuous over time, and that changes in the category of garbage result in profound changes in trash activism. The first chapter of my dissertation looks at American eastern coastal cities between 1840 and 1880, from the publication of the first health survey in New York to the beginning of the sanitation reform movement. I hypothesize that the health surveys of the 1840s and 60s that located, mapped, and defined garbage and its effects, as well as other “accounting” measures developed in the period, allowed garbage to cohere into an entity that was functionally homogenous despite its acknowledged varied material make up. This allowed it to be identified and productively controlled–that is, contained— for the first time in history. While there were kitchen scraps and ashes, old shoes and horse manure littering the streets before this time, these objects all had different values, levels of “nuisance,” and destinations. I hypothesize that the health surveys and their classification methods organized the ontology of garbage into something that could be readily identified by the public, feared, and rhetorically evoked to rally public action, resulting in new epistemologies and regimes of management and control. In effect, I hypothesize that garbage as we know it today was “invented” in this period. 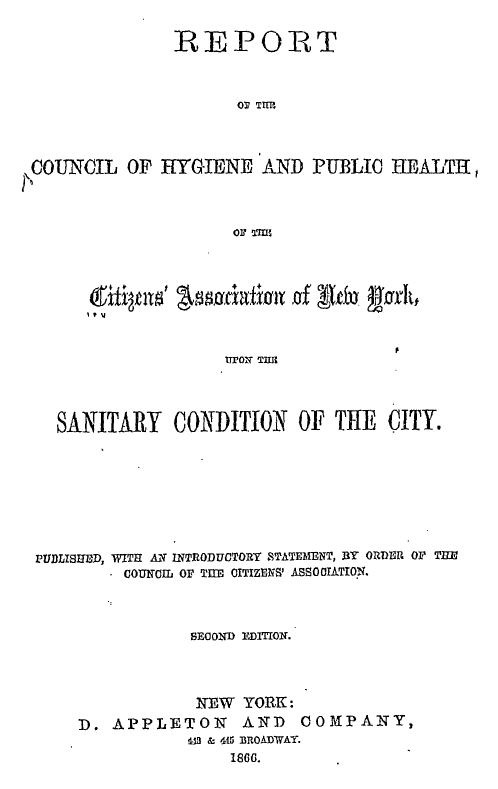 Title page for second sanitation/health survey of New York City, 1866. My second chapter will investigate the “paradigm of pollution” that developed during the 1950s and 60s. In this case, a distrust of Big Industry and Big Science, the rhetoric of the Cold War, including nuclear weapon and waste protests, the publication of Rachael Carson’s Silent Spring, and a permanent, visible plethora of non-biodegradable “disposables” radically challenged what garbage was, how it polluted, and what could and ought to be done about it compared to how it was conceived of at the turn of the century. This was the second trash crisis of containment. A crisis of containment is the result of garbage systematically exceeding, breaking down, or permeating not only material boundaries, but more importantly, social limits and control. The breech of social norms is what creates the impetus for change, even though the crisis focuses on material objects. In the nineteenth century, garbage newly signified both the threat of cholera and immigrant rebellion during a period of mass urbanization and immigration. In the 1950s and 60s, chemical modes of pollution and contamination were “discovered” as the globalization of industrial capitalism began to threaten ecosystems on unprecedented scales. Thus, by studying the time just before successful national trash activism, I am studying the conditions of possibility that allowed garbage to be diagnosed, located, categorized, and managed during previous crises of containment. My subject is the social stakes, communication strategies and cultural interpretations that launched these successful social movements. Unquestionably, I am framing these garbage crises as social crises and not merely crises caused by an abundance of a certain type of material (garbage) and its attendant technical problems (how to get rid of it). During a crisis of containment, the management, dangers, and very character of everyday garbage are defamiliarized as threat, transformed into something new, and then naturalized as part of that crisis’ strategies and solution. I have chosen the sanitation reform movement and the birth of the popular environmental movement rather than, for example, the New York City garbage strike in 1917 or the national landfill crisis during the 1980s, because the latter were crises of accumulation and intensification; garbage itself was not ontologically or epistemologically challenged during these times, and as such were not crises of containment as I am using the term. A crisis of containment is failing to take place today; the material transgressions of garbage are not matched by transgressions of social norms or limits. My dissertation is a historical genealogy that will investigate the conditions that redefined “garbage” during these two previous moments of revolutionary trash activism, and compare them to the problems faced and tactics used by trash activists in the twenty-first century. What are the social, cultural, and material conditions that allow garbage to cohere into one type of object and threat during a particular moment in time? In other words, why are certain types of garbage and trash activism legible and possible at a given moment, and others not? Secondly, how does “the historical awareness of our present circumstance” affect what and how we know about garbage and how we deal with it today? How can we “update” ideas about garbage to create new forms and paradigms of trash activism? Your historical project is fascinating and, as you make clear, necessary. Here are some thoughts from a fellow waste scholar in the hopes that it might lead to further conversations. I think your intention to examine how garbage ‘congeals’ at specific moments into different ontological and epistemological objects is very promising. In some ways this is reminiscent of Gille’s (2007) book on Hungary’s transitions from ‘socialism’ to ‘post-socialism’, where she examines different regimes of waste and emphasizes, in particular, how the material contingency of matter ‘bites back’ against different efforts to control and contain it. I suspect your more Foucauldian approach might pose interesting complications for her totalizing concept of ‘waste regime’ and vice versa. In my view, the idea of a ‘crisis of waste’ is a moral claim that requires explanation and not something to be assumed. Indeed, your project could be seen as a way of explaining the repeated (re)invention of waste as crisis. My point is not the same as O’Brien’s (2008), who asks in ‘A Crisis in Rubbish?’ whether or not there is one. Instead, we might ask to what extent the perception of crisis is a product of the histories of reform you describe. It is hardly novel to see waste as a problem nowadays. In the US and other so-called “western” societies, the last thirty years have been dominated by sweeping regulations. If, as you suggest, the 80s and 90s represent a period in which garbage ontologies and epistemes did not change much, perhaps this is a consequence of garbage having been stabilized, i.e. made legible and governable, to an unheard of degree. It is no accident, of course, that this regulation renaissance in some areas of the world coincided with an explosion in global waste traffic, but even this led, in turn, to yet more regulation (e.g. the Basel Convention). And this leads me to wonder about the history of our present and to what extent it has influenced your research directions, as well as others’ and my own. Consider John Clark, Tim Cooper and John Scanlan’s historical work on this subject in the context of the UK and Europe. As I understand it, they are preparing a book of some kind on the history of waste (see disconnecting.org/scanlan/inside.html). Clark has one paper you may wish to examine, ‘The Incineration of Refuse is Beautiful’ (journals.cambridge.org/action/displayAbstract?fromPage=online&aid=105293)where he documents how community activists were involved in contesting the spread of 19th century ‘destructors’ throughout England. In my own work I have looked at waste activism of different sorts in the U.S. and Europe with a similar fascination and I wonder: Why all this interest in waste activism now? After all, movements existed before, as you point out. Where were their historiographers? It may be that we (by which I mean the likes of you, Clark, Gay Hawkins and myself) are interested in the micro-politics of waste, in counter-publics, radical movements and situations of dissensus, precisely because our present has been defined by regulatory hegemony, of state-level efforts of containment, categorization and control. It is noteworthy that you open with the Pacific Garbage Patch, since this represents, in a way, the apotheosis and the limits of the regulatory genealogy I am describing. These seas of plastic confront Euro-American regimes of waste governance in much the same way as Somali Pirates do their powerful navies. They force ‘us’ to ask: who can be held responsible? How can the problem be solved? Who are its victims and how do they seek redress? It is no accident that both crises are concentrated in the open ocean, outside national borders. Pirates aside, one wonders if we are now witnessing a return to waste activism after decades of high regulation. You’ll notice that those attempting to study and clean up the Patches are not governments, but sailors, scientists, environmentalists and NGOs. At the very least, we have new reason to be curious about what can be done and what has been done at ‘local’ levels when the failures of grand waste regulation are becoming apparent. But, does acknowledging new approaches to waste ‘from the bottom up’ force us to reconsider familiar ‘waste as crisis’ narratives? I very much enjoyed reading this and would love to hear more about your work in the future. We live in an age of convenience but there will be a time where our children will pay for the price on our behalf. It’s mind boggling to think that prior to the 20th century there was no plastic bag or plastic drink bottle and yet society still managed to function perfectly. We could learn much from our past.